You need a lean cut of new-season lamb for this spring dish. Hang on to the recipe for winter as well, though, and buy frozen podded broad beans – pop out the inner kernels from the outer membrane. Set a heavy-bottomed frying pan over a medium-high heat, add the olive oil and 1 tbsp butter and brown the lamb on all sides. Continue to cook for 5–7 minutes, turning the meat. The lamb will cook quickly and should be served pink. Remove from the pan and leave to rest in a warm place for about 10 minutes. About 5 minutes before serving, melt the remaining butter in the pan. Add the shallots and cook for 1 minute, then add the broad beans and enough stock just to cover. Bring to the boil and cook for about 2 minutes. Add the fresh mint leaves and season. Slice the lamb (the meat is tender, so can be sliced quite thickly) and divide between 4 warm plates. Spoon the beans alongside the slices and serve. 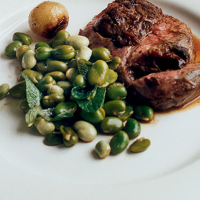 This is a supremely wine-friendly dish, great with just about any red, but claret would be the traditional English choice for lamb.